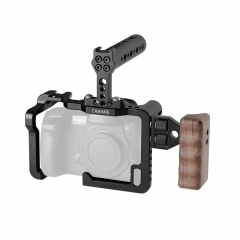 • This full frame cage is especially applied to the Panasonic GH5 DLSR cameras and features a formfitting design and a full protection for your Panasonic GH5. 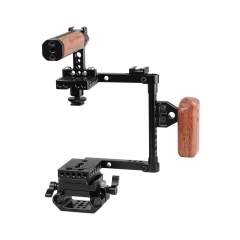 It provides plenty of 1/4"-20 & 3/8"-16 mounting points from top, both sides, to bottom. 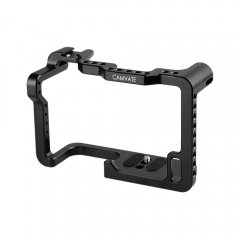 • You are free to do more DIY configurations based on this basic full frame cage such as attaching a top/side handle, QR baseplate to connect a tripod, a rod system or some other setups. 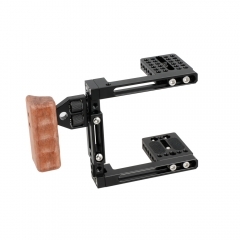 It's very solid and durable. 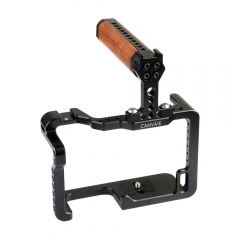 CAMVATE Full Cage Rig With Top Handle & 2 Sho..
CAMVATE Panasonic GH5 Camera Cage Full Frame ..
CAMVATE Panasonic GH5 Full Cage Kit With Hand..
CAMVATE Quick Release Cage Kit (Right-sided W..
CAMVATE Dual-use Adjustable Cage with Wooden ..